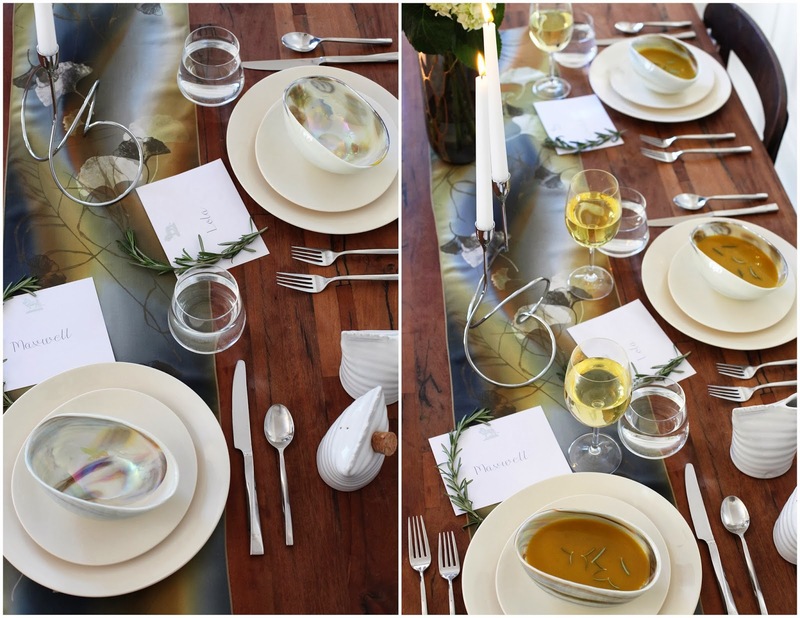 Inspired by our Murano Glass Bowls and Ginkgo Leaves Scarf, our table was graced with shimmering golds, lustrous silvers and pearlescent ivory. Acting as a perfect complement to this color palette, our Aubin Framed Reproduction could just as easily have been a window to the fall colors outside. 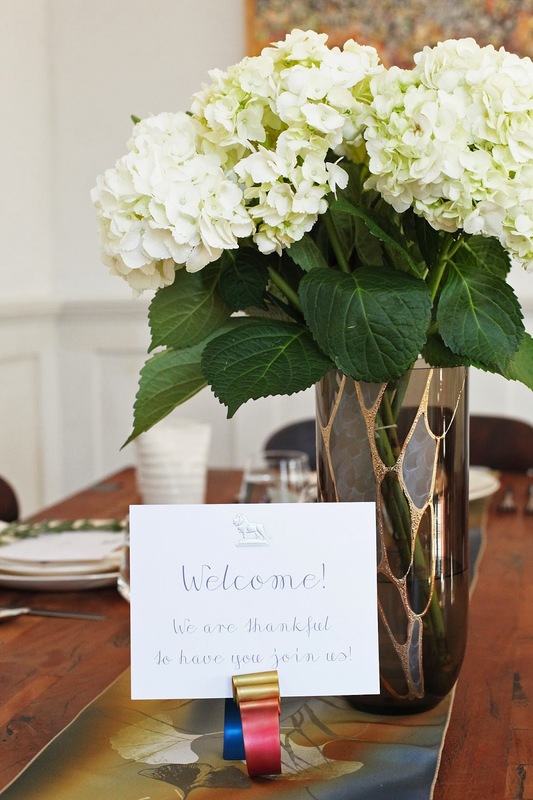 Our collection is filled with truly versatile products, and we put that to the test... We used our Lion Correspondence Cards as place cards, the Metal Ribbon Cuff as a holder for our note of greeting, and the Ginkgo Leaves Scarf as a table runner. We love using our products in unexpected ways! For a classic centerpiece, we chose an elegant vase of smoke gray and luminous gold. Filling it with simple white hydrangeas added some rustic charm, while allowing the vase to remain the shining star. Candlelight is an easy way to create atmosphere, generally relaxing the mood and making the meal feel more intimate. The polished chrome of our Loop Candleholder reflects the flickering flame, casting a soft glow across the table. The organic shape of our Hand-Thrown Cream and Sugar coordinated perfectly with the underlying natural theme; the polished ceramic maintaining it's simple elegance. It's easy to get caught up in cooking, decorating, entertaining; but it's fun to take a moment and reflect on the important things. We created a book of memories with our Lion Correspondence Journal, documenting all who gathered together this day... and all they are grateful for. Our Murano Glass Bowls are exquisitely handcrafted, so beautiful we were almost sorry to fill them. With soft pearlescent waves gracing the interior of the bowls, it's just one more reason to finish that last drop. The jade-green discs and antique copper overlay of our Jade Drops Platter creates dimensional beauty, not to be outdone by the main course. It's as simple as that! 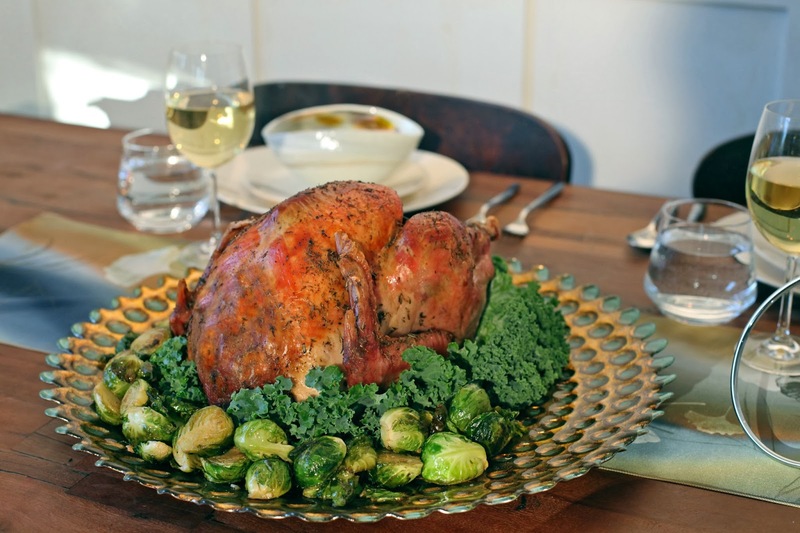 Sit back, relax, and bon appétit!